In What's Your Favorite Color?, fifteen beloved children's book artists draw their favorite colors and explain why they love them. This personal collection will undoubtedly inspire readers to create favorite color drawings and stories of their own! "A book certain to engross and enthrall." —Kirkus Reviews, starred review, on What's Your Favorite Color? "A creative collection to savor one-on-one or to spark classroom art and writing exercises." 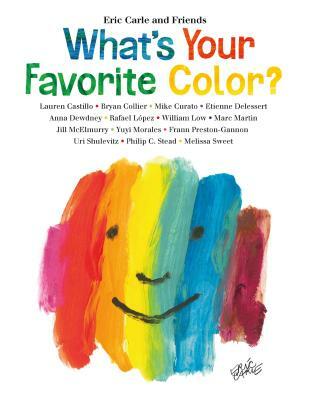 —School Library Journal, starred review, on What's Your Favorite Color? "From thought-provoking to lyrical... audiences will love to chime in with their own choices." —The Bulletin, on What's Your Favorite Color? "Showcasing 14 contemporary (mainly American) picture-book illustrators, this handsome volume asks the title question and devotes a double-page spread to each artist's answer." —Booklist, on What's Your Favorite Animal? "This menagerie offers picture-book lovers of all ages a glimpse into each creator's style, personality, and brand of humor." —Kirkus Reviews, on What's Your Favorite Animal?